born in Philadelphia on February 21, 1854. He attended the University of Chicago and Rensselaer Polytechnical Institute before entering the U.S. Military Academy, where he graduated 5th in his class. In 1878 he became a 2nd lt. in the 8th Infantry and was later transferred to the Signal Corps in 1890. By 1913 he was a brigadier general and the chief signal officer of the U.S. Army. He served at various foreign posts during his military career. He was the military attache to Mexico City in 1894 and in Rome from 1894-97. In 1898 he served as the chief signal officer of the department of the Gulf in the Spanish-American War, and then with the 4th Philippine expedition where he served on the staff of General Welsley Merritt and was part of the occupying force of Bohol Island under the command of Major Hale. His other military posts and roles included: Cuba, 1899; chief signal officer China Relief Expedition, August-November 1900; St. Louis Expedition, 1904; chief signal officer, Department of the East, 1904-1909, of the Philippines division, 1909-1911; cited for “gallantry in action” against Chinese Boxer forces at Yang-Tsun, August 6, 1900, and at Peking, August 14-15, 1900; badges for service with or during: Spanish-American War, Philippine Invasion, Army of Cuban Occupation, China Relief Expedition, Mexican Expedition, the Great War (WWI). 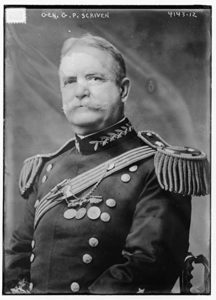 He retired from the Army after 42 years of service in February of 1917 but continued to serve under the status of “active service in case of war.” He served as the military attache to Rome by direct appointment by the Secretary of War and Secretary of State starting in September of 1917. There he served as the military advisor to the Italian Army during the war. He was awarded the decoration of Grand Officer Crown of Italy in 1918 for his service with the Italian troops during the war. He wrote two books: “Transmission of Military Information” in 1908 and “The Story of the Hudson Bay Company” in 1929. He died in Washington DC on March 7, 1940. The journal was written partly as a personal memoir and partly as a draft or notes for a book that he was planning on writing. Because of this, the journal jumps from a personal narrative to various drafts for paragraphs that describe the invasion and occupation of Bohol Island. The order and flow of Scriven’s writing have been preserved. In this presentation for the web, the diary has been divided into nine sections so that it is easier to view and retrieve via the net. The breaks are made arbitrarily at about every ten pages. They are not divided by subject matter nor were the original sections denoted by Scriven himself… The <angle bracket> symbols around particular words indicate that those words were in the margins or inserted outside the lines of the text. The words that appear crossed out here were crossed out by Scriven in the diary. In this transcription, word spellings were kept as they were in the original. 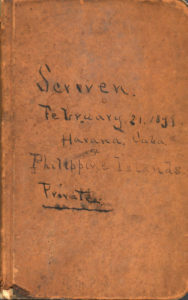 The digitized version of George Percival Scriven’s memoirs related to the Philippines was developed as a project of The Digital Scriptorium of the Duke University Special Collections Library. Norman Cameron, a researcher, transcribed the diary and made the transcription and an essay about the events described in the diary available in electronic format. We are especially grateful to Brooke Guthrie, Research Services Librarian, who communicated permission to include the diary in the Philippine Diary Project, crediting the David M. Rubinstein Rare Books & Manuscript Library as the holder of the original diary. The version of the diary in the Philippine Diary Project departs from the Duke University version in attempting to put together relevant passages instead of leaving it up to the reader.